As part of my monitoring process I review the list of dividend increases every single week. I use this exercise to check on the health of companies I own. I also check the list of dividend increases as part of my overall monitoring of companies I am reviewing for potential addition to my dividend portfolio. I do find it helpful to narrow the list down by focusing only on the companies that have raised distributions every single year for at least a decade. Next, I tried to discuss each company and provide some helpful stats in order to determine if they look promising under certain circumstances. The fact that a company that has raised dividends for a decade is just the first step in the process for further research. Making sure that those dividend increases are as a result of improving fundamentals is important. Equally important is making sure that the dividend company in question is also attractively valued. The Procter & Gamble Company (PG) provides branded consumer packaged goods to consumers in the United States, Canada, Puerto Rico, Europe, the Asia Pacific, Greater China, Latin America, India, the Middle East, and Africa. Procter & Gamble increased quarterly dividend by 4% to $0.7172 per share. 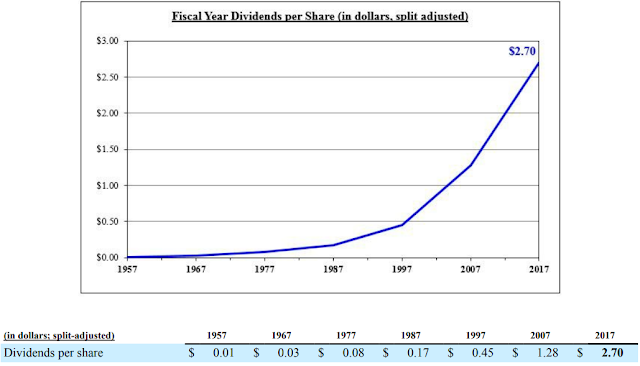 This marks the 62nd consecutive year that this dividend king has increased its dividend. P&G has been paying a dividend for 128 consecutive years. The ten year dividend growth rate is 7.20%/year. However, as was discussed in my last analysis of Procter & Gamble, the company has been unable to grow earnings per share since 2008. Therefore, the dividend payout ratio has been increasing steadily over the past decade. Furthermore, the rate of annual dividend increases has been decelerating, as the payout ratio is close to reaching its upper limit. As a result, future dividend growth will be harder to come up. Therefore, while the stock seems fairly valued 18.70 times forward earnings and a dividend yield of 3.70, the lack of earnings growth and the high forward payout ratio at 68% make this company a hold. I will continue holding on to my existing P&G, waiting for a turnaround. However, the dividends will be allocated elsewhere. Enterprise Products Partners L.P. (EPD) provides midstream energy services to producers and consumers of natural gas, natural gas liquids (NGLs), crude oil, petrochemicals, and refined products. The company operates through four segments: NGL Pipelines & Services, Crude Oil Pipelines & Services, Natural Gas Pipelines & Services, and Petrochemical & Refined Products Services. Enterprise Products Partners raised its quarterly distribution to $0.4275/unit, a 3% increase over distribution paid this time last year. This is 55th consecutive quarterly distribution increase for Enterprise, which has rewarded partners with a raise for 20 years in a row. The ten year distribution growth is 5.70%/year. This dividend achiever is one of the better managed partnerships out there (the other being Magellan Midstream Partners). I like the fact that it does have some margin of safety in its distributions coverage from DCF. However, as I have alluded before, the pass-through business model is more exposed when things get tough due to the needs for constant access to capital markets for growth. That being said, an investor looking for high current income may find the 6.60% distribution yield appetizing enough for some exposure to the partnership. Automatic Data Processing, Inc. (ADP) provides business process outsourcing services worldwide. The company operates through two segments, Employer Services and Professional Employer Organization (PEO) Services. Automatic Data Processing raised quarterly dividends by 9.50% to $0.69/share. 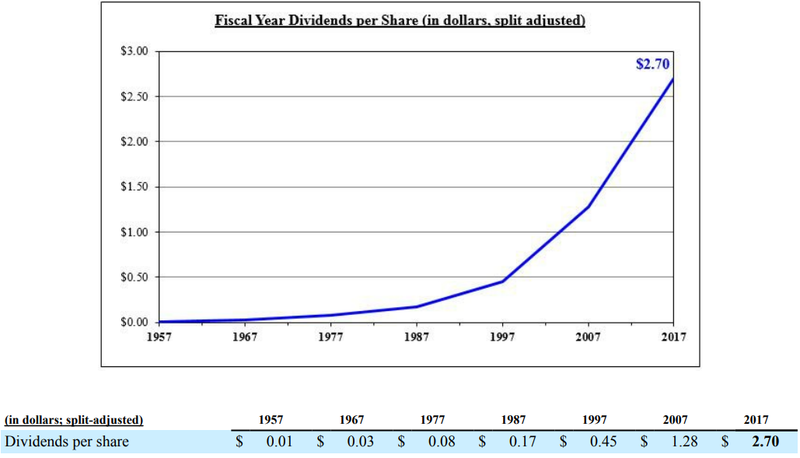 This dividend aristocrat has a 43 year track record of annual dividend increases. The Board of Directors is also considering another hike in November (consistent with historical pattern of dividend hikes). The ten year dividend growth rate is 11%/year. I like the growth in earnings over the past decade for ADP. In addition, I like their business model. Unfortunately, the stock has been overvalued for quite some time, while compounding earnings and dividends for shareholders. Right now ADP is selling at 27.60 times forward earnings and yields 2.40%. I would be interested in adding to my stock there on dips below $84/share (equivalent to a forward P/E below 20). Tanger Factory Outlet Centers, Inc. (SKT), is a publicly-traded REIT headquartered in Greensboro, North Carolina that presently operates and owns, or has an ownership interest in, a portfolio of 44 upscale outlet shopping centers. Tanger’s Board of Directors approved a 2.2% increase in the annual dividend on its common shares from $1.37 per share to $1.40 per share. Tanger is a dividend champion which has increased its dividend for 25th consecutive years. The ten year dividend growth rate is 6.70%/year. The latest dividend increase certainly is on the low side, and it signifies the challenges in the retail industry today. Those challenges could impact portfolio occupancy, and from there impact rental income and FFO. That being said, Tanger is selling at a low valuation today of 9.30 times forward FFO. In addition, the REIT yields 6.60% today. The FFO forward payout ratio is 57.60%, which is sustainable and leaves a margin of error even if things deteriorate further from here. The low valuation is the reason I have bought some shares as they have been sliding over the past year. While I do want growing earnings over time ( or in the case of REITS – growing FFO/share), I do understand that a low valuation can result in great performance over time. The potential investor in Tanger today is getting paid 6.60% to hold on to a quality REIT, with a margin of safety in distribution coverage of 57.60% based on FFO/share. At that valuation, the REIT needs to grow only by 2% -3%/year to generate a total return of 10%/year. Check my analysis of Tanger for more information about this REIT.